Welcome to Part Two of the three-part series on souls. Last week’s article: Design Journal #1 - Introduction to Souls, talked about what a soul is, how souls utilize skills ramps with reincarnation to create a feeling of progression in the presence of permadeath, how souls get more powerful with age, and most controversially - Talents. This week we’ll examine the first two phases of character creation, including soul selection and birthdate selection. As part of the coverage on birthdate selection we’ll take an in-depth look at the Destiny system and how it’s different from traditional quest and story engines. We’ll conclude this week’s design journal with an introduction to Achievements and the reassuring fact that you’re not alone in the world. Your spiritual double may be trying to kill you, but at least you’re not alone. Before I forget, I promised the very active community over at ChroniclesofElyria.com I’d slip an Easter egg into each design journal. Pay close attention, somewhere here-in lies the subtle hint of a previously (and still) unannounced feature. 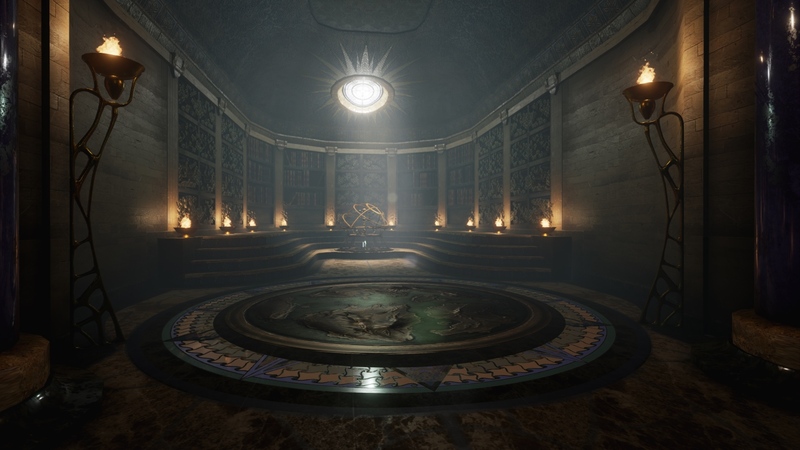 Character creation in Chronicles of Elyria is a multi-step process that takes place entirely within the Soul Chamber. As mentioned in last week’s design journal, the Soul Chamber is where souls go in order to rest, recuperate, and plan the time and place of their next incarnation. The first step in character creation is to select which soul you want to use. In the soul selection screen (See Figure 1) you can see the name, age, affinity, skill ramps, talents, and past achievements of each soul. That latter two, Talents and Achievements, won’t be visible the first time you play a soul. 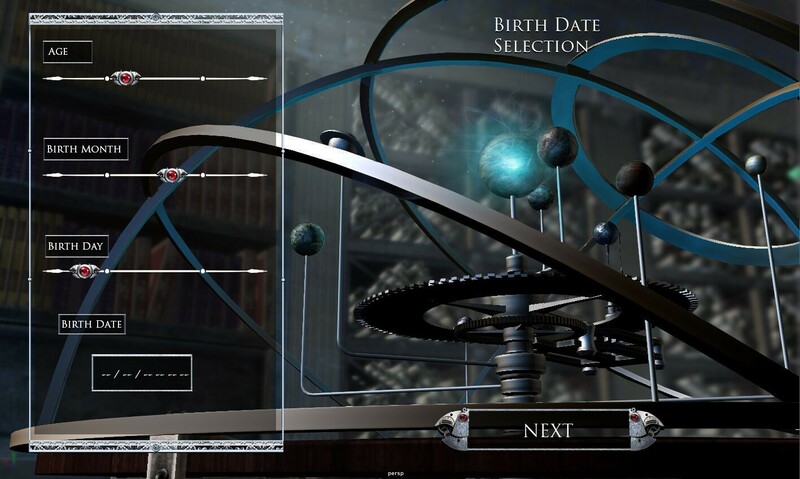 The second phase of character creation is birthdate selection (see Figure 2). This might seem like an arbitrary step but it’s actually extremely important. Selecting your age does three things. First, it helps filter out which families you can join in the next phase of character creation. Sorry, no twenty-something families with 40 year-old children. Likewise, the retired farmer and his elderly wife are too old for your energetic youthfulness. If you want to join a family, you’ll need to make sure your character’s age lies within a reasonable window of what is feasible (read not creepy). The second thing selecting your birthdate does is, well, determines your character’s starting age. The younger your character begins the more time you’ll have to tailor their skills to your liking. This is especially true if you create a teenager. Creating characters less than 18 years old gives you a period of advanced skill development called “Adolescence”. During this time, characters gain new skills more rapidly as a way to experiment with different skill trees. But, being an adolescent isn’t all it’s cracked up to be. Starting with an older character means more financial stability, an established occupation and skill tree, and more time focused on building a family and settlement. The final thing your birthdate does is help define your destiny. The Soulborn Engine uses a form of astrology to determine the types of conflicts your character will encounter as they roam about the world. At that precise moment your character is born, each celestial body holds some position in the heavens - their gravitational force pulling you in different directions. Like a map of the future, the position of each planet charts a course that dictates the theme of your character’s life and the types of obstacles you’ll face. When your character finally grows old and dies, the passing of time will necessitate a new birthdate, and with it a whole new set of adventures. People have come to think of NPCs as the quest dispensers and story-tellers in modern MMOs. To experience more game content players move from one quest hub to another, looking for the next NPC that will drive the story forward. Chronicles of Elyria works the exact opposite. The moment your character is born some large set of story quests are dynamically generated and silently follow you around wherever you go. Any time you come in contact with another NPC, loot an item, reach a certain age, commit a crime, or a slew of other things, the Soulborn Engine looks at your pre-defined list of plot hooks to determine if any of them have been triggered. Like a key turning a lock, if everything lines up and all preconditions have been met a story will unfold. You could spend twenty Elyrian years searching for your destiny, only to retire to your farm and launch a story arc digging up some artifact while tilling your fields! The designers and writers at Soulbound Studios are working on a 10-year story that, like a “Choose Your Own Adventure” book, allows players to select which path the story will follow. As players take individual and collective actions, scripted events will trigger that drive the story toward the next closest checkpoint. These player choices could be anything from killing an important NPC or player, to building a village at a pivotal location on the map, to killing off a species of animal, to a character entering the world with a specific birthdate. The point is, even something as seemingly innocuous as being born can alter the course of history. And even more interesting, we at Soulbound Studios will be just as surprised as you when these world events occur! As a side note, everything we’ve talked about thus far applies in a broader sense to your soul as well as your character. Each soul has a set of pre-determined themes and conflicts which characters will face during the course of play. Unlike those things tied to your birthdates these themes and conflicts can be spread over many lifetimes and you may not encounter them for years to come. Likewise, each soul has a set of possible roles to play in the ongoing 10-year saga, but it’ll be up to you to determine how you respond. For many people the idea of destiny, pre-determined conflicts, and a road map of their overall play experience is a scary and claustrophobic idea. Players want to feel like they have a destiny without feeling constrained by it. That’s where affinity comes in. A soul’s affinity is its tendency towards light or dark and is visible within the Soul Chamber. A soul is first created with a neutral affinity but it will not remain that way for long. Player actions leave a mark on the soul, blessing or tainting it. As a result, souls gradually develop an affinity one way or the other. Your soul’s affinity is respected by the destiny system and the dynamic story engine. Conflicts and story arcs will initially be presented with no indication of the preferred outcome. It will be up to you to determine the best way to resolve the conflict. As your soul lightens or darkens, the story engine will learn from what you’ve done and act in accordance with your chosen affinity. While you might have once been asked to just talk to a player, you may later be asked to pick someone’s pocket, and then eventually to maim or kill someone. Be warned, affinity is a slippery slope. Once you move to the light or dark it becomes more and more difficult to resist. While not impossible, the Soulborn Engine will be giving you tasks and objectives which it believes best suits your nature. Doing the opposite will mean failure and there will be consequences for your action. Achievements in Chronicles of Elyria are a lot like Achievements in other games, with a few key differences. First, and perhaps most important, Achievements in Chronicles of Elyria are rewards given to players for participating in the story. That means fulfilling the requirements for completing an Achievement always has a measurable and recognizable impact on the world. In exchange, earning an Achievement comes with passive (and sometimes active) bonuses which can include new abilities, changes in social status or reputation, titles, and fame. An example of something that could be completed by anyone would be killing a daemon. While not common, it is possible, and in addition to other cool benefits comes with the title of Daemonslayer. Being crowned Champion of the Colosseum is something that may only be achieved by one person at a time. These types of achievements will often be held by the same player more than once. Finally, killing a specific, legendary evil is something that can only ever be achieved once. It should be noted that these achievements may be given to multiple people simultaneously, but there will never be another opportunity to earn the same Achievement. Finally, Achievements are bound to the soul. Once attained, an Achievement becomes a permanent part of a soul’s memory and past-life experiences. Once the character ages and dies the Achievement will be listed on the Soul Selection screen as a reminder that the Achievement was completed by that soul. With that said, reincarnation is a trying experience. Death, and the process of rebirth, leaves a soul without its full memories. As a result, benefits from past-life Achievements may not be fully realized upon character creation. Instead, characters will exist with partial or secondary buffs until such time as their new character is able to complete the same Achievement again (if possible). This process of re-completing a past-life Achievement, referred to as Déjà vu, unlocks the Achievement’s full potential - this time with compounding effect. We all want to believe there’s someone out there who shares our same feelings and goals. Someone who fully understands us. Someone who truly loves us. Unfortunately, we can’t tell you if that’s true or not. What we can tell you is you’re likely not alone. Each soul has a kindred spirit, a twin, a soul mate that is identical in every way. If a soul has a talent, the twin will have a talent. Whatever the destiny of the soul, the twin shares the same destiny. This permanent link between souls results in several mutual benefits. First, the closer soul mates are to one another the more aware they are of the other’s presence. Within some limited distance a soul mate can always locate their twin. Second, Soul mates are so acutely attuned to the memories and experiences of the other that within some limited distance they begin to pick up on the skills of the other. It’s said when two soul mates come in contact their skills become so acutely attuned that they complete one another - granting the combined skillset to both soul mates in everything they do. Finally, the shared connection between soul mates acts as a battery to their spirit. So long as they are near each other, and so long as their bodies can endure, a soul mate separated from their body will always have sufficient spirit to find their way back from the Astral Plane. Sounds great, right? There’s a catch. Soul mates only begin their existence as twins. Each soul lives their own lives and develops an affinity toward light or dark. While their destinies are inexorably intertwined, there’s no guarantee they’ll lie on the same side of the cosmic struggle when they meet. Most importantly, soul mates whose affinity go in opposite direction become diametrically opposed to one another. To that end, there is only one way to get past such an antagonist – separate their soul from their body and send them back to the Akashic Records. Next week we’ll conclude our look at the Soul System in a Design Journal about Aging and Dying. In addition to learning more about the effects of aging on your character, you’ll learn about the difference between maiming, dying, and permadeath. Finally, next week’s design journal will include a sneak-peak of some in-game footage of the Astral Plane – the place your soul travels to when separated from your body. Rereading this 2 years later -- and it's still one of the most exciting things about this game, lol. THANK YOU for being original!! Rereading this 2 years later -- and it's still one of the most exciting things about this game, lol. THANK YOU for being original!! So I guess i'll have to keep a Chi'at'y Nesdr on me at all times, just in case my other, in game twin is evil/extremely good. You can have as many characters as you are willing to play for. You start with 3 souls of different affinities from which to choose, you just have to apply a Spark Of Life to activate. Think of Souls as Character Slots and the Sparks as the Characters in other games. Just FYI, each Soul/Spark/Character remains in the game 24 hours a day, they never actually log out. So if you make 2 or 3 characters/alts ALL of them will actually age at the same time depending on game play. Each Spark is expected to cost around $30 for 7-12 months of game play which will actually cost $60 or $90 for 2 to 3 characters for a 7-12 month period. You can have as many characters as you are willing to play for. You start with 3 souls of different affinities from which to choose, you just have to apply a Spark Of Life to activate. Think of Souls as Character Slots and the Sparks as the Characters in other games. Just FYI, each Soul/Spark/Character remains in the game 24 hours a day, they never actually log out. So if you make 2 or 3 characters/alts ALL of them will actually age at the same time depending on game play. Each Spark is expected to cost around $30 for 7-12 months of game play which will actually cost $60 or $90 for 2 to 3 characters for a 7-12 month period. 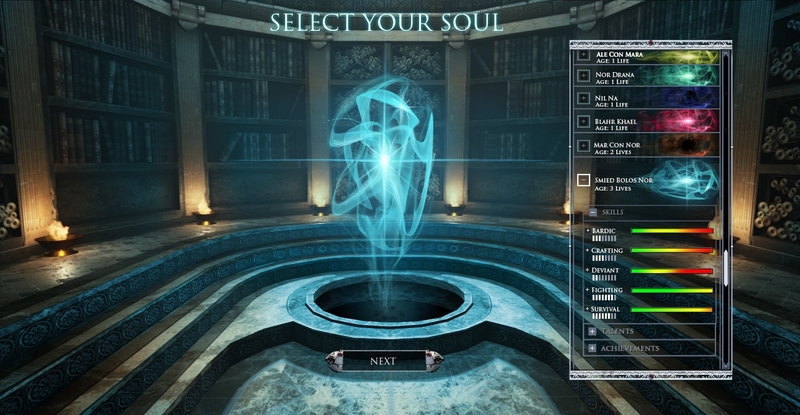 Soul selection screen, does that imply having multiple accounts as long as you pay for the sparks of life? Multiple souls under one account. Sparks to power them. Posted By **CptBloodBeard** at 11:43 PM - Fri Jul 14 2017 > > Soul selection screen, does that imply having multiple accounts as long as you pay for the sparks of life? Multiple souls under one account. Sparks to power them. One idea I have heard in discussion about souls and NPC bothers me on both a moral and Role Playing aspect. One of the Developers said that NPC really had no souls as such. There for it was OK that we are reincarnating into a child's body and steal their life from them. I know this is being done for ease of game mechanics but the basic primus and end result are simply WRONG. The system should no more allow us to treat NPC poorly than we seem to want PC's to be treated. PvP has a cost to it if you actually KILL not incapacitate your enemy. Is that not exactly what we are doing to the host we take over? Should they not have a chance to understand the act of giving you control of their lives and futures? Should they not have the right to say NO if they want to live their own lives. Maybe they had a destiny to fulfil also and you have taken that from them and the world. Does this not also devalue the lives of all NPC's because they 'have no souls'? Why fight to save someone in a heroic fashion if you are told they are a needless prop to the background game mechanic? Maybe it would be better to treat all NPC's as a Role Playing adventure should. Would it not be better to share the life and memory of your new host? If you are a Star Trek fan think of the Trill symbionts and how they played out in the story arcs. Think of the PR possibilities if a 50+ year old wakes in the shared mind of a teenage child or relative. Would it not add interesting twist to have an old enemy return in a youthful body. The twist that they would have a clean slate in their new identity to make your life hell all over again. Being Neutral or balanced between Light and Darkness could be a goal. However, human nature says that it's not really likely to happen. You could either remain largely apart from the world and its distractions from your Balance. Otherwise you would become a schizophrenic Jedi trying to balance the last Light act with a Dark one. Either way you would not be much trusted by anyone else to be of use to them. More likely seen as a danger to deal with than anyone's Ally. Sure is a different format. What happens to people that want balance that worship the twofold queen? Am i the only one? Does anybody know when or if, this game goes BETA? There is no date for it yet, but it will go through all the alpha/beta stages, and a few more. Posted By **DirgeOfSorrow** at 7:30 PM - Mon Sep 26 2016 > > Does anybody know when or if, this game goes BETA? There is no date for it yet, but it will go through all the alpha/beta stages, and a few more. I only heard about this game a week or two ago, but I've never been drawn into a game so much before. I have already combed through everything I could find on this game, now I'm going back to make sure I haven't missed anything. Hey! Welcome to the community. I am pretty new as well! Only heard about it at the end of July. If you haven't already you should check out the Newcomer Starter Pack: Begin Here! forum post. It has all the information you need to get a better understanding of the game! Everyone was super helpful when I wanted to get some answers, so if you ever need help just ask on the forums! PS. I shamelessly devoured most of DM21's Videos which was super helpful because it followed the early development of the game to the post-Kickstarter period where we are in! Hey! Welcome to the community. I am pretty new as well! Only heard about it at the end of July. If you haven't already you should check out the [Newcomer Starter Pack: Begin Here! ](https://chroniclesofelyria.com/forum/topic/1605/newcomer-starter-pack-begin-here) forum post. It has all the information you need to get a better understanding of the game! Everyone was super helpful when I wanted to get some answers, so if you ever need help just ask on the forums! PS. I shamelessly devoured most of [DM21's Videos](https://www.youtube.com/playlist?list=PLwQj_EgI4VN_F4clGSfjns1ZXomOWdnzs) which was super helpful because it followed the early development of the game to the post-Kickstarter period where we are in! Good luck! I've read this game in facebook, and here I am now, trying to learn and digest everything in order to catch up to those who have known this for a while. Hope this game will become available in the Philippines. Is a soulmate guaranteed- on character creation, will we definitely have a soulmate in the world? If the soulmate is a player character, what if they quit the game- will we be stuck without our soulmate? What if we don't like our soulmate? Is it possible to sever that bond, and maybe get a new one in our next life, or will the soul have the same mate forever? Everything in this blog is pretty epic and original. It will be fairly amazing to witness it come to pass effectively. Looking forward to it!! I wonder if alternate endings could be a thing. Like if you fight your destiny, and create a whole new destiny because of it. My soul is trembling in anticipation, and dreams of great heights are flooding my head with various scenarios! Okay, aside from the poetic nonsense, this is fantastic! For a moment, I was slightly nervous about the soul mate thing. I jumped to the usual thought that "soul mate is love" and freaked out until I read that soul mates are just twins. I think the twins are a good thing - any chances I'd be twins with my real life sibling? Haha, probably not. All these things makes me want to go and make a story, haha. My soul is trembling in anticipation, and dreams of great heights are flooding my head with various scenarios! Okay, aside from the poetic nonsense, this is fantastic! For a moment, I was slightly nervous about the soul mate thing. I jumped to the usual thought that "soul mate is love" and freaked out until I read that soul mates are just twins. I think the twins are a good thing - any chances I'd be twins with my real life sibling? Haha, probably not. All these things makes me want to go and make a story, haha. I'm honestly loving this game the more I read - but I hope you understand I'm a little hesitant. It sounds far too complexly AMAZING, and through that, a strong game, to be true. So I really want to believe that you can do it, but I'm not sure I can yet. My soul is tingling with excitement. I haven't felt this way since I was a little girl, looking at Paper Mario advertisement posters. Love it all.. super deep and insightful. Can't wait to read more. The more I read, the more I wish this was already around to play. I love the idea of the twins! It makes me want to try and find mine when this game comes out! I also love how "deja vu" is considered a previous life skill or memory. The fact this game uses the Akashic Records is profound. I am absolutely enthralled with this game already. Keep it up team, you're creating a historic game. Well that was deep... Awesome none the less!